The foreign-born population in the United States increased by more than 20 million in the last three decades, a surge driven primarily by the large-scale migration from Latin America and Asia. Women played an important part in this wave of migration, which is still ongoing. The number of female migrants more than doubled from 1980 to 2004, increasing from 7.3 million to 17.2 million. The question is whether the increase in the number of female migrants has changed the gender composition of the foreign-born population. In fact, as the female migration to the U.S. was growing, male migration increased at an even greater pace during these years, almost tripling between 1980 and 2004 (from 6.4 million to 17.1 million). As a result, the female share of the migration decreased from 54% in 1980 to 50% in 2004 (Appendix Table A2). To understand how gender composition has evolved during a time of increasing migration, this analysis examines the flow of migration—the number of foreign-born persons coming into the U.S. in a given time period—as well as the stock of foreign born—the absolute number of foreign-born persons in the U.S. population at a given moment. Migration Flow: The number of foreign-born persons coming into the U.S. over a given time period. Information on the migration flow is derived from a question on the Decennial Census long form and the ACS that asks when a foreign-born person entered the U.S. Most of this analysis focuses on individuals who said they had entered the U.S. in the five years before they were enumerated. So, for example, from the 2000 Census the analysis focuses on people who entered the country between 1995 and 2000. For the sake of simplicity, immigrants in the country for five years or less are referred to here as recent immigrants. Migration Stock: The absolute number of foreign-born persons in the U.S. population at a given moment. Census Bureau data shows that while the absolute number of female migrants has increased, the proportion of the migration flow that is female has declined slightly. In the 1980 Census, 1.6 million foreign-born females reported having migrated to the United States in the previous five years, compared with 3.7 million in 2004. The increase in the number of males, however, was just as substantial (Figure 2). As a result, the proportion of females among recent immigrants declined from about 50% in 1980 to about 48% in 2004. Although this is a relatively small change, it is moving in the opposite direction of the change in gender composition evident worldwide during the same time period. Worldwide, the stock of female migrants has been increasing slowly but steadily, rising from 41 million in 1975 to 95 million in 2005, according to tabulations by the United Nations. Along the way, the percentage of females in the worldwide migrant population rose from 47.4% in 1975 to 49.6% in 2005. The growing role of women in migration is attributed to several factors, among them the on-going transformation of the agricultural sector and the global competition for goods and services, which has profoundly altered the labor market. In addition to these economic factors, changes in gender relations within families are believed to spur migration as women seek greater control over their mobility and standard of living. The United Nations data on migrant stock indicates that the percentage of female migrants has increased since 1975 in all but two regions of the world: Asia and North America (Table 1). The most significant increase took place in Europe, where the percentage of female migrants rose from 47.7 in 1975 to 53.4% in 2005. Africa and Oceania, which includes Australia and New Zealand, also saw increases of about 4% over the same time period. The United Nations subdivides Asia into four regions: Eastern, South-central, South-eastern and Western. The percentage of female migrants increased in all but Western Asia, which includes most of the countries in the Middle East as well as Turkey. In all the other sub-divisions, the share of female migrants increased. In Northern America, as the UN classifies the continent, the most significant changes occurred in the two largest countries: the United States and Canada. In Canada, the percentage of female migrants increased from 49.9% in 1975 to 52% in 2005. In the United States, meanwhile, the percentage of female migrants decreased from 52.7 to 50.2. Studies that have examined the gender composition of legal immigrant inflows, a population that includes legal permanent residents, refugees and those seeking asylum, show that females very often comprise a majority of arrivals. As significantly, these studies show that females have historically dominated legal immigration. From 1930 to 1979, females accounted for 55% of all legal admissions to the United States (Houstoun, Kramer, and Barrett, 1984). More recently, females have been less than a majority of legal admissions in some years but that began to change in 1990. Since then, a rising share of legal admissions has been female (Zhou, 2002). This conclusion is based on an analysis of those who were granted legal permanent residency and included refugees and those who received asylum. In fiscal year 1985, females accounted for 49.8% of legal admissions. That dipped to 46.7% in 1990 and then rose to 53.7% in 1995 and 55.4% in fiscal year 2000. The number of legal admissions jumped significantly during this time period as a result of the Immigration Reform and Control Act (IRCA), a 1986 law that offered amnesty to approximately 3 million unauthorized migrants. By the late 1980s and early 1990s, these now legalized migrants were able to sponsor family members who were then permitted to enter legally. Total legal immigration increased from about 600,000 in 1988 to 1.8 million in 1991 as the IRCA beneficiaries were processed. Since 1990, a rising share of legal admissions to the U.S. has been female. The trend toward more female legal migrants that began in 1990, however, has been countered by another significant change in the overall migrant population. Beginning in the 1990s, the share of unauthorized migrants increased while the share of legal migrants decreased. By 2004, more unauthorized migrants than legal migrants were entering the United States. Despite the increase in female legal migrants, the foreign-born population overall became more male because males were a greater share of the largest contributor to this population: the unauthorized flow. By 2005, according to Pew Hispanic Center estimates, 58% of adult unauthorized migrants were male. Meanwhile, a majority (52%) of the adult female population was legal. Examining Census Bureau data on countries of origin for migrants shows that the decrease in the proportion of female migrants in the United States was primarily driven by what happened with migration from Mexico and Central and South America—the prime sending areas overall and the source of most of the unauthorized migrant population. Mexico, Central and South America account for more than three-quarters of the unauthorized population, Mexico alone accounts for 56% of the unauthorized population. Migration from Mexico reflects the larger trends in gender composition. In 1980, about 300,000 female Mexicans reported having migrated to the United States since 1975 (Figure 3), accounting for about 45% of the Mexican migration. In 2004, about 1.1 million Mexican-born females said they had arrived in the previous five years, or about 42% of all recent arrivals from Mexico. Migration flows from Central and South American countries other than Mexico have been more female. But, as is the case with Mexico, women from Central and South America have comprised a declining share of the flow from 1980 to 2004. In 1980, 53% of the recent migrants from Central and South America were females. 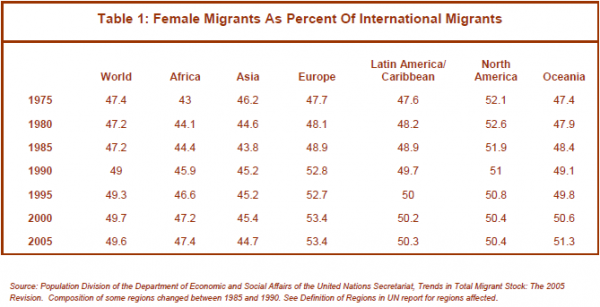 By 2004, 48% of the migrant flow from other Central and South America countries was female (Figure 4). In almost all other countries in Central and South America—Panama being the only exception—the proportion of women migrating to the U.S. declined from 1980 to 2004. (Appendix Table A5) In Panama, the share of female migrants increased from about 60% of the flow in 1980 to 64% in 2000. Guatemala also stands out because the proportion of female migrants decreased significantly. In 1980, a majority of migrants from Guatemala were female but by 2000 females accounted for only 36%. Migration from the Caribbean, which accounts for between 6% and 8% of all international migration, has been majority female since 1980. In fiscal year 1982, about 48% of legal admittances were female. By fiscal year 2004, the rate increased to 54% This trend has been fairly steady, with the exception of fiscal year 1990, when admittances were high due to the Immigration Reform and Control Act legalization programs. In fiscal year 1990, 46.7% of admittances were female. The share of females among recent migrants from Asia increased slightly from about 50% in 1980 to 52% in 2000. Although the overall flow of recent migrants from Asia has become slightly more female, several countries are a notable exception. The share of females among recent migrants from Korea, the Philippines, India, Thailand, and Hong Kong has declined from 1980 to 2000. On several key characteristics, the profile of recent female migrants has changed considerably since 1980. 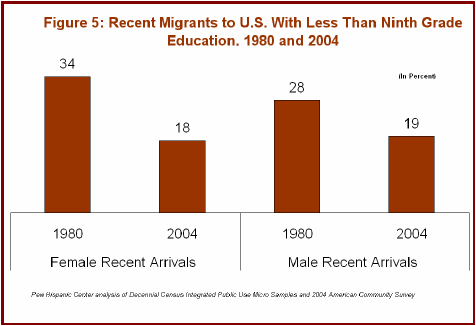 Those who migrated to the United States between 1999 and 2004 tended to be better educated and older compared with those who arrived between 1975 and 1980. Fewer of them also arrived as children and fewer of them had ever been married. Since 1980, recently-arrived females have made significant gains in education. The educational level of recent female migrants improved considerably since 1980. More female migrants attended high school or college, and fewer dropped out. This held true regardless of the region of origin and is consistent across all age groups. The school enrollment of newly-arrived female children rose from 82% in 1980 to 86% in 2000, reflecting an overall increase in the enrollment of foreign-born teens. As significant, however, was the decline in the high school dropout rate (Fry 2006). The female teenage high school dropout rate declined from 13% in 1980 to 9% in 2000. Overall, migrant children from all regions of origin were more likely to be in school in 2000 than in 1980. Among adult female migrants, school and college enrollment also increased, rising from about 13% among newly-arrived females age 18 and older in 1980 to 17% by 2000. Again, this increase held for all women regardless of region of origin. Other studies have shown a slight improvement in the educational attainment of male immigrants (Betts and Lofstrom, 2000). The Census data shows that male migrants also had better educational credentials than their counterparts in 1980. But the strides made since 1980 by recently-arrived female migrants outpaced the gains of males over the same period. The proportion of female recent arrivals (age 25 and over) with less than a ninth grade education fell sharply, from 34% in 1980 to 18% in 2004. The share of recent arrivals with a college degree also increased from 18% in 1980 to 33% in 2004 (Figure 5). By comparison, the proportion of males with a college degree increased from 29% in 1980 to 34% in 2004. Women were generally far behind in all levels of educational attainment in 1980. By 2004, they were just as educated as the males. Women from each of the major sending regions displayed improvements in educational attainment. For example, in 1980 about three-quarters of newly-arrived women from Mexico had less than a ninth-grade education. By 2004, the rate dropped to 43%. In 1980, about 30% of recent female arrivals to the U.S. were children. By 2004, the proportion had dropped to 22%. The effect of this change is evident in the average age of recent female migrants, which increased by two years over this period. Among Mexicans, the decline in the number of females migrating as children has been especially significant given the size of this population. Mexican female migrants are still younger overall, but proportionally far fewer of them arrived as children. The share of children among recent female immigrants declined from 38% in 1980 to 27% in 2004. Recent female migrants are somewhat more likely than their counterparts 25 years ago to have never married. In 1980, a little more than a quarter (27%) of recent female migrants were never married. By 2004, the proportion increased slightly, to 30%. Female migrants from Mexico and Central and South America were more likely to not have married than recently arrived migrants from other parts of the world—again significant because women from these regions are a growing proportion of the migrant flow. Moreover, the proportion of female migrants from Mexico who have never been married also increased since 1980. In 1980, 30% of recently arrived females from Mexico had never married. By 2004, 32% had never married. A declining share of female migrants had children of their own living with them in the U.S. In 1980, more than half (51%) of female migrants 15 years of age or older were parents of children living in the U.S. By 2004, the rate had decreased to about 47%. (The Census does not have information on whether a migrant has a child living in the country of origin). This change, however, was driven by females from Asia and elsewhere. There was no change among female recent arrivals from Mexico and Central and South America. Among Asians, the share of female migrants who had their own children living with them in the U.S. decreased from 55% in 1980 to 46% in 2004. Among female arrivals from the other regions (mainly Canada, Europe, Africa, Australia, and New Zealand), the rate decreased from 50% in 1980 to 42% in 2004. About 55% of Mexican females who arrived between 1975 and 1980 were parents, the same rate as those who arrived between 1999 and 2004. Among recently arrived females from Central and South American countries, the share of parents remained unchanged (45%) during the same time period. By 2004, female migrants were far less likely to work in agriculture and manufacturing. Comparing the labor force participation of female migrants, two significant changes emerge between those who arrived between 1975 and 1980 and those who arrived between 1999 and 2004. The number working fulltime decreased overall, but those who were employed worked more weeks every year. Female recent migrants also moved away from agriculture and manufacturing and more into the service sector. The share of recent female migrants working more than 47 weeks per year increased from 46% in 1980 to 51% in 2000. But those who worked full-time (35 hours per week or more) decreased from 78% in 1980 to 71% in 2004. By 2004, recently-arrived females were much less likely to be working in manufacturing and agriculture than recently-arrived females in 1980, mirroring larger shifts in the U.S. labor force. Among Mexican-born females, for example, the rate of employment in manufacturing decreased from 44% among recent arrivals in 1980 to 20% among recent arrivals in 2004. In agriculture, the rate among recently-arrived females from Mexico decreased from 10% to 6%. Among recently-arrived males, the rate of employment in manufacturing has also dropped but not so in agriculture, which held at about 17%. 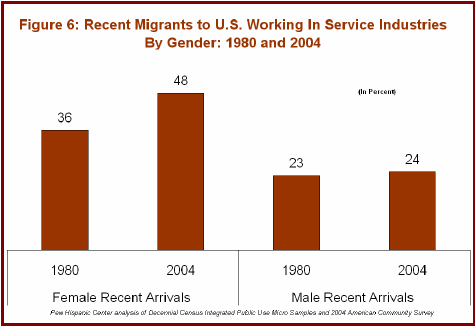 Instead of manufacturing and agriculture, recently-arrived female migrants in 2004 found jobs in service industries, including wholesale and retail and eating and drinking places (Figure 6). For example, the rate of female recent migrants from Mexico who worked in eating and drinking places nearly tripled, increasing from 7% in 1980 to 20% in 2004. A much larger proportion of female recent arrivals in 2004 originated from the Western hemisphere than was the case 25 years ago, reflecting the growth in migration from Mexico and Central America. 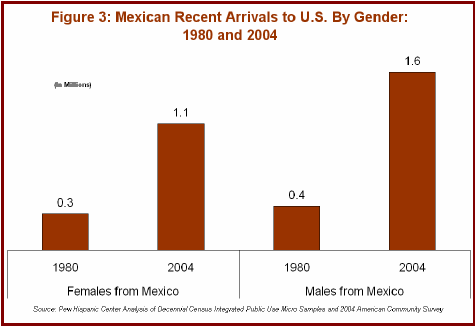 The share of female migrants from Mexico increased from 20% in 1980 to 30% in 2004. Female migrants from other Central and South America increased from 10% in 1980 to 16% in 2004. 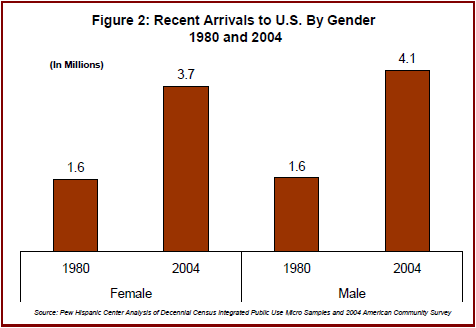 Overall, about 56% of female recent arrivals originated in the Western hemisphere in 2004, up from 40% in 1980. 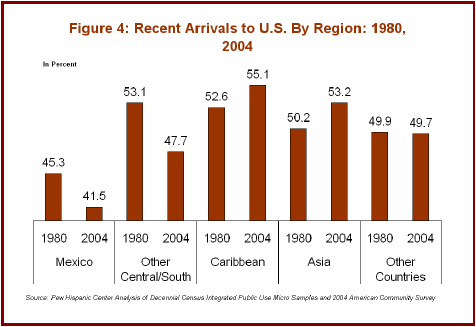 The proportion of male recent arrivals from the Western hemisphere increased even faster, rising from 42% in 1980 to about 61% in 2004. Female migrants in 2004 were far less likely to reside in California and in other established settlement states compared with those who arrived between 1975 and 1980. This mirrored the general dispersion of the immigrant population (Singer, 2004; Passel and Suro, 2005). The proportion of recent female migrants who reported residing in California declined from 34% in 1980 to 22% in 2004, a trend driven in great part by the dispersion of the Mexican population, both male and female. As recently as 1990, over 60% of newly arrived females from Mexico resided in California. By 2004, the proportion of Mexican-born females who were recent arrivals and living in California declined to about 31% (Figure 7). The pattern evident among Mexican migrants extended to other female migrants and showed that California was no longer the magnet it once was. In 1990, almost a third of recent female arrivals from other Central and South American countries resided in California. 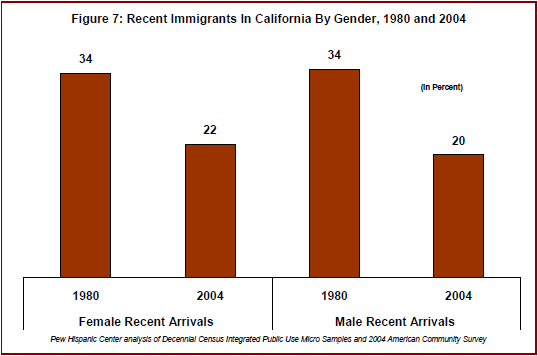 By 2004, California was home to 14% of newly-arrived females. The same held true for females from Asia. In 1990, more than a third (39%) of newly arrived females from Asia lived in California. By 2004, the share of females from Asia had declined to 29%.